In terms of the constrained energy expenditure model of physical activity (whereby beyond a certain increase in activity, total daily calorie expenditure stays the same), this small mouse study is pretty cool. 15 mice were housed in indirect calorimetry chambers that contained running wheels. 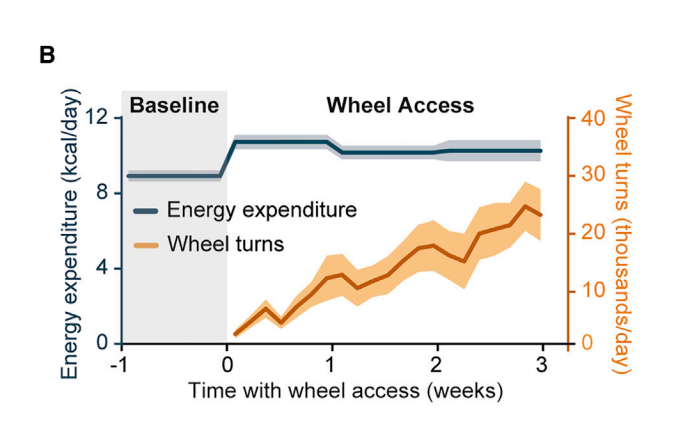 The experiment included a habituation phase, then a locked wheel phase, and finally a run as much as they wanted phase. 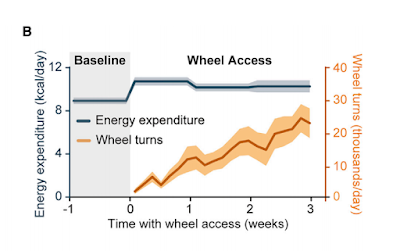 All told, despite a doubling of wheel use, the mice' total daily energy expenditures stayed roughly the same - elevated somewhat from their wheel locked baseline, but stuck at an elevation seen with slight use. The researchers observed a pattern they'd previously hypothesized - mice who ran more on the wheel, were less active when off the wheel. 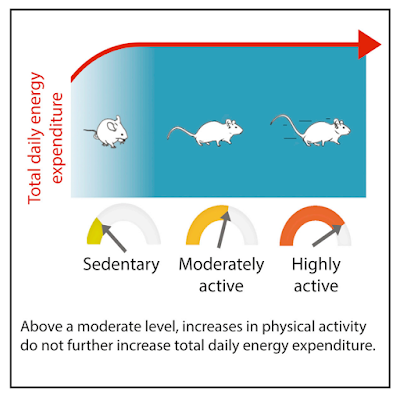 And though not measured, researchers also wondered whether increased muscle efficiencies with time might also be playing a role in the lack of increased energy expenditures. "physical activity should be encouraged for its overall health benefits, while expectations concerning its role in weight loss should be kept realistic." Exercise is primarily for health, not weight loss.